The wedding bouquet is a lot like a wedding dress. Although wedding bouquet in Singapore differs in shapes and sizes, every bride needs one. Streaming from an ancient tradition, it is believed that the bridal bouquet represents the good fortunes and future prosperity of the bride. Today, the bouquet may also symbolise the personality of the bride, which is why many brides carefully pick the one that can truly represent them. But what makes a perfect Singapore wedding bouquet, and how should you go about choosing the perfect bouquet for your big day? There are many considerations you need to take into account. While it seems easy to just choose whatever you think looks good, you should not make a rash decision to avoid regretting it in the end. 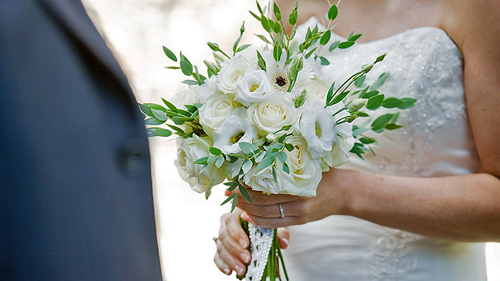 Here are some tips to help you select your wedding bouquet. Not all wedding bouquets work with every body type. Your bouquet should be relative to your body frame as you want it to complement your dress, not clash with it. A small bouquet can make you look like you are carrying your flower girl's’ posy instead of a once-in-a-lifetime flower arrangement. If you are tall, you should go for a longer arrangement, like cascade bouquets or arm sheafs. Shorter women should choose a more compact bouquet so that it will not overwhelm the size. Women with a larger frame may opt for a fuller flower arrangement. Many brides pick flowers based on the appearance and popularity. While there’s nothing wrong with this, it is highly advisable to choose flowers with specific meanings. Go for something that bests represents your union. 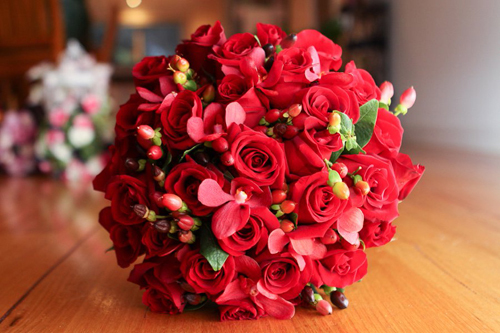 Red roses are the most popular choice since they are considered to symbolise love. Some brides add a little ivy in their bouquet to symbolise fidelity while others incorporate it with yellow irises for passion. Whatever you are feeling, there’s surely a specific blossom that can represent it. Even if everyone in the wedding is clueless about it, it will be more special if you walk down the aisle holding a bouquet with a great meaning. When choosing your bouquet, don’t forget the bouquets that your bridesmaids will be holding. Keep your bouquet in proportion to the ones your bridesmaids will be carrying, but there should be a slight difference. You can have the same size but you should either change the colour or use a different flower type. Your bouquet and the bridesmaids’ bouquet can go all the same look but have yours slightly bigger. Your bouquet should reflect your style and must have significance, but if you want to personalise it, even more, you can add additional details to it. For instance, you can pin family heirlooms like a brooch to the bouquet wrap. If you are having a beach wedding, starfish and shells make great accents to your bouquet. You can add a small butterfly pendant or ladybug pin if you are having a garden wedding. You can transform your ordinary looking wedding bouquet into extra special by simply adding a personal touch. The options are endless, just think of what you want to achieve. 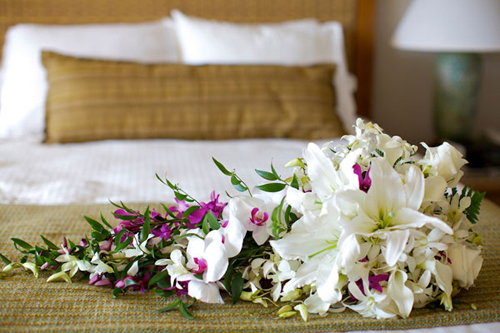 Make sure to discuss your plan to your wedding bouquet florist Singapore so she or he can share some ideas.